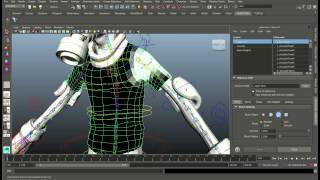 ngSkinTools is a skinning plugin for Autodesk® Maya®, introducing new concepts to character skinning such as layers, any-pose-mirroring, enhanced paint brushes, true smoothing, and more. Skinning layers are a central feature of ngSkinTools. With them, you break your rig down into easier manageable parts and edit them separately, then blend everything together through layer transparency. They’re not just a simple way to make your work more organized - they also physically isolate groups of influences from the rest of the rig, so paint and edit operations won’t mix-in influences you were not expecting. This also allows you do things that were impossible before: per-layer mirroring, adjusting influence weight up/down through layer transparency, blend transferred weights with previous weights, to name a few. You won’t need to go to T-pose again when going through paint+mirror cycle, you can mirror in any pose now. There’s also a much greater control over what influences mirror onto which one: associating left-right influences by name without prefix, manual association overrides, etc. Mirroring is also layer-friendly, so you can mirror just the parts of your model you’re currently working on - very helpful, when you want to keep other parts of your rig intact. ngSkinTools has its own set of paint tools, which are capable of working on a per-layer basis. Each tool maintains its own intensity, which is handy when toggling between smooth and replace through shift-modifier. Smooth is completely redesigned and you’re going to just love it. The new smooth brush gives much better results, as it operates on all influences of a vertex at once. For even greater control, the more precise “relax weights” tool is there, which also can smooth across mesh boundaries and thin meshes. 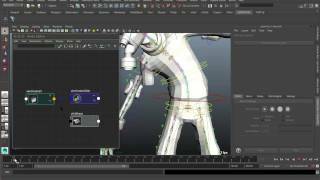 ngSkinTools operate on standard Maya skinCluster (also known as “smooth skin”), so no custom nodes will be required to use your rig. Plugin has a couple of custom nodes, but they’re only required until the rig is complete, and can be deleted after, so your work should stay compatible with most pipelines out there. All of the computing-intensive operations are being handled by a C++ plugin, and are being constantly tested on high-resolution meshes. 1.7.8 (*2019-Jan-27*) * Added: Maya 2019 support * Fixed: various standalone license activation issues on Macos and Linux * Fixed: various shelf bugs. ngSkinTools will now create it's own shelf instead of adding a button to "Custom" shelf. 1.7.6 (*2018-Jun-20*) * Fixed: UI under some conditions could open in broken state when closing/reopening ngSkinTools window. * Fixed: skinCluster would sometimes start producing warnings "The weight total would have exceeded 1.0". * Fixed: macOS autoloader now properly recognize the plugin 1.7.5 (*2018-Mar-29*) * Fixing previous release build issues. 1.7.4 (*2018-Mar-22*) * License activation related bugfixes 1.7.3 (*2017-Oct-12*) * Adding OSX builds for Maya 2016 and 2016.5 1.7.2 (*2017-Oct-04*) * Linux/Maya 2016 should properly load now. 1.7.1 (*2017-Sep-28*) * Fixed: plugin should now properly load on Linux. * Some changes in parallel evaluation of skin weights calculation in attempt to get rid of some mysterious crashes. 1.7.0 (*2017-Sep-27*) * Fixed: mesh should redraw properly after mirror undo/redo; * Mirroring should now properly respect vertex selection; 1.6.1 (*2017-Mar-28*) * Fixed: occasional crash when switching tools while painting 1.6 (*2017-Mar-21*) * Added: "Distribute removed weight" option in Paint tool. When turned on, all weight that you remove from current influence will be distributed to all other influences in a vertex proportionally. In short, this is about the same behavior as Maya's standard paint tool, except with one difference: if vertex only had single influence, removing it will not work while this option is turned on. * Added: "Stylus Pressure" settings for Paint tool - ngSkinTools will now remember it's own settings for tablet settings. 1.5.4 (*2017-Mar-10*) * Fixed: leftover bugs that were not seen in debug mode. 1.5.3 (*2017-Mar-10*) * Fixed: UI issues in 2017 (errors after startup, stacktrace spam in script output). For few other 2017 UI issues that I could not reproduce - I kindly ask to retest with this new release and let me know if you still have it, like https://www.pivotaltracker.com/story/show/139744241 or https://www.pivotaltracker.com/story/show/139743793; * Added: "Edit | Delete Custom Nodes From Selection"; * "Reset to default preferences" moved to "Help" menu (to not accidentally interfere with more frequently used edit operations; * Fixed: flooding mask with vertex selection not always properly updates skin weights; * Fixed: smoothing uninitialized mask leaves it uninitialized (was being filled with zeroes before); * Added initial multithreading support. Calculating skin weights, as well as mesh-to-mesh mapping (used in mirror and weight transfer) should be considerably faster. * Fixed: influence mapping is not calculated during painting if interactive mirroring is not enabled (also could have written this as "speeds up initialization of paint tool by up to 2 seconds for very large influence counts") * Fixed: slight speed improvements for influence mapping calculation; 1.5.2 (*2016-Dec-22*) * Fixed some performance bottlenecks for loading and writing skin weights. 1.5.1 (*2016-Dec-22*) * Fixed: replace and scale brushes not properly removing weight in some cases; * Fixed: starting a paint tool with no active layer does not enter a colored mode for mesh; * Fixed: Deselecting a layer while painting leaves mesh black, and does not repaint when selecting a layer again. Only downside: I wish if it can highlight the joint we choose in the viewport -not just in the tool window- makes it easier to avoid confusion. It's available free for non-commercial usage, & pricing for individual artist & another pricing if for a whole Studio.. latest version can be downloaded from it's main site.. At the end,, this is an excellent tool that will increase your work's quality, shorten your production time, make skinning a joy instead of long pain, worth each penny . 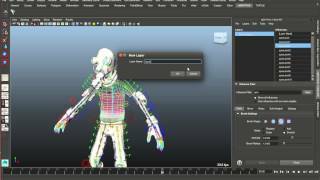 Any chance for Maya 2018 support sometime soon? My only regret is that I didn't find this plug years ago. ngskin has cut our time we spent on weights in half, and we're getting more precise control with layers. This swiss pocket knife for handling weights has saved us from a number of potential headaches.